Finally on the road again. 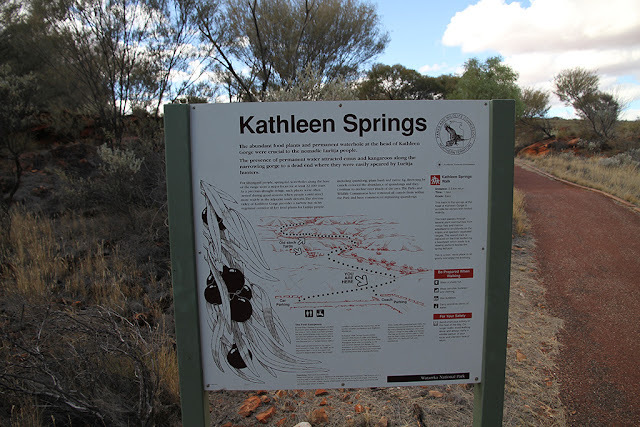 We left Yalara and headed for Kings Canyon. We setup camp in the unpowered section of the “Resort”. It was good to have a bit of space around us again. We thought the definition of “Resort” was being stretched a bit. It wasn't a bad van park but “Resort” was stretching it a bit. After setting up we went for a drive and did the 2.4km walk into Kathleen Springs. 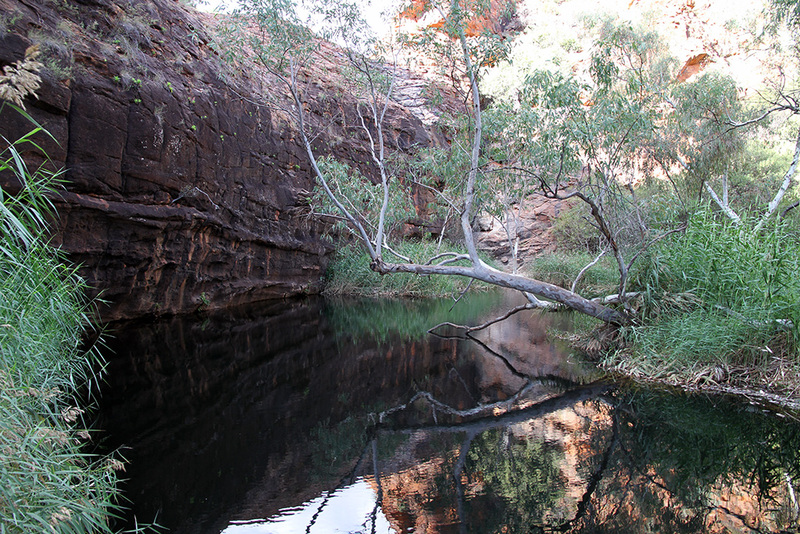 A nice easy walk to a little water hole. On the way back into camp I picked up a 6 pack of Coopers Sparkling Ale for a cheap $33! Maybe that is why they call it a resort, because they know how to charge “Resort” prices. At least it was a lot better than the beer prices at Yalara. There it was $35 for a 6 pack of light beer and $45 for a 6 pack of Crownies! Those prices were enough to make me go dry for the time that we were there!!!!! 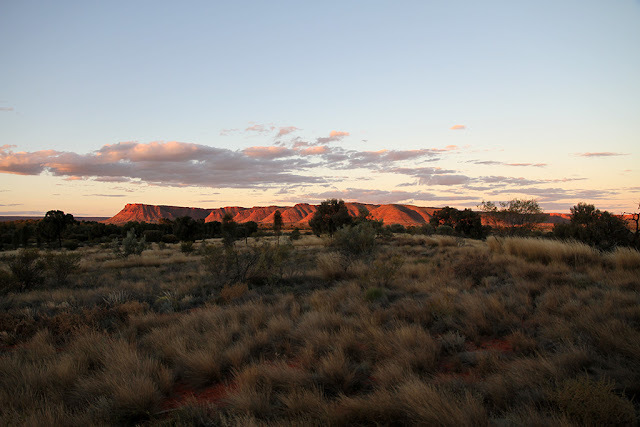 Just before dusk I went up to the sunset observation deck to watch the sunset on Kings Canyon. It was a bit of a let down compared to the Uluru sunset. You were a lot further away from the Canyon. It was more like just watching the sunset on a normal mountain range. The only positive was they had the sunset drinks cart come out to the sunset deck :-). Unfortunately resort prices though :-(. While I was watching the sunset, Jodie stayed at camp starting to get dinner ready. 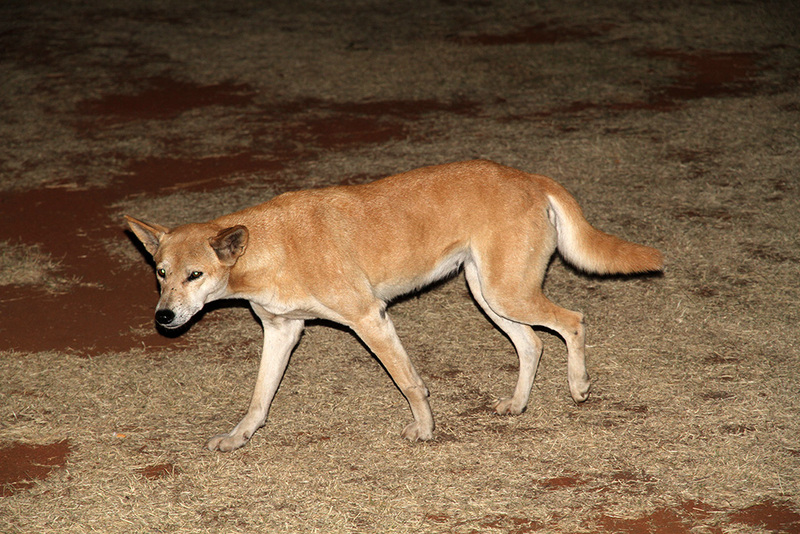 At that time the dingos started to wander into camp. 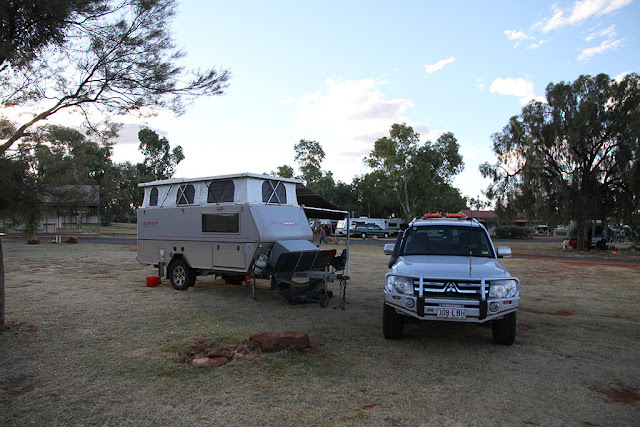 A young family in small camper trailer not far from us also went to the sunset deck. They also left the back of their car open and a dingo jumped in and started rummaging through their stuff and dragged a grocery bag out. Luckily another camper scared it off so it didn't get any of their food that time. 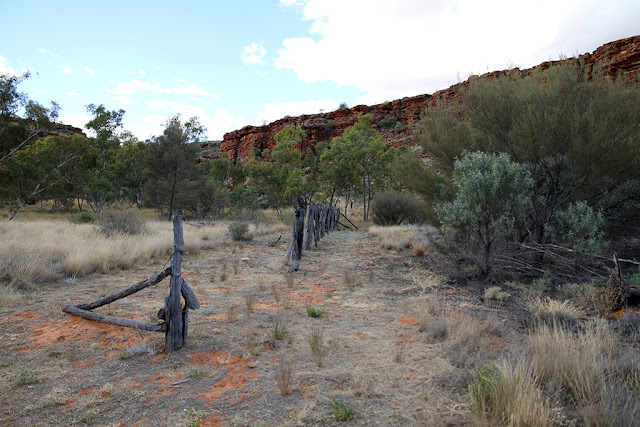 The dingos were so common around camp that they had installed gates on all of the entrances of the amenity blocks to keep them out. While Jodie was off having a shower and I was cleaning up after dinner, I needed to make a quick comfort stop due to the 6 Coopers. I was only gone from a couple of minutes but in that time a dingo had ripped apart our rubbish bag and spread it all around camp! They are quick!! Due to the dingo incident we met a couple from Tasmania, Jeremy and Cassandra, that had camped close by. After we finished cleaning up we met them at the bar for a few more drinks.